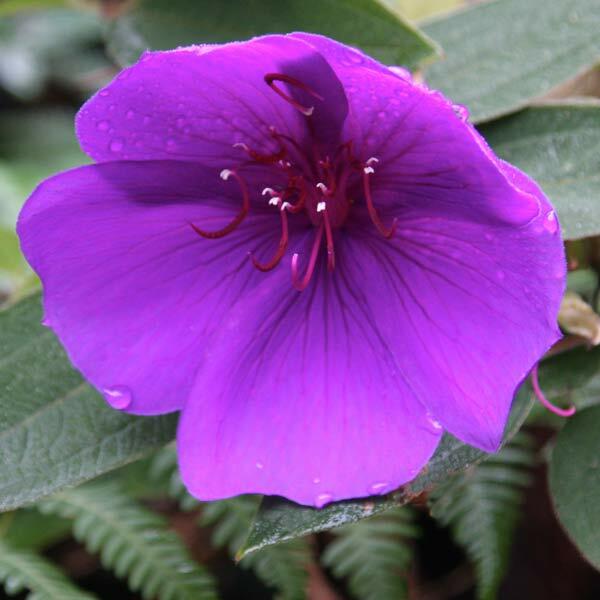 Tibouchina are also known as Lasiandra and are a favourite flower shrub with many well known cultivars offered by wholesalers. A fairly adaptable plant that will grow from Queensland through to Victoria and is popular in all of these areas. Although they are native to South America they have been adopted by many Australian gardeners as a ‘go to’ flowering plant. An old favourite is ‘Alstonville’ however landscapers are now blessed with lower growing or dwarf varieties that add more versatility to planting schemes. The taller cultivars will reach to around 3 – 4 m and do suffer a little in windy positions as the stems can be brittle. The lower growing types such as ‘Jules’ will reach around 1m in height and are an excellent choice for growing in containers as well as in the garden border. Carol Lyne – Large flowers on a medium sized plant to 1.5 – 2m in height. Latin Princess – Deep royal purple flowers on a smaller growing plant to around .5m. Groovy Baby – Compact form suited to growing in containers, easily kept to under .5m. Masses of flowers. Jazzie – Reaches around 1.5m in height, free flowering. Kathleen – A large growing variety with wonderful pink flowers, will reach around 3 – 4 m in height.